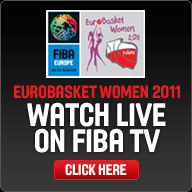 The waiting is over and the EuroBasket Women 2011 has finally started. In Katowice the competition was opened with a match-up between Greece and Latvia while in Bydgoszcz Turkey faced Lithuania. For this edition of the European Championship womensbasketball-in-france will cover only Groups C and D live. We will provide a day summary from Bydgoszcz later. Dimitra Kalentzo came up big with 20 points and 3 assists to lead Greece past Latvia (67-57). Spain huffed and puffed their way to victory against Germany (79-69) with a balanced scoring attack. Alba Torrens, Elisa Aguilar and Amaya Valdemoro scored 18, 17 and 16 points each. Poland never got out their starting blocks. Only Agnieszka Szot was in double digits. 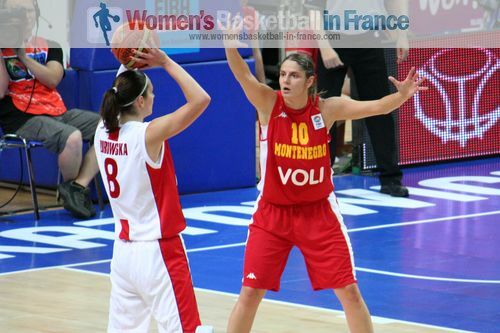 They lost to Montenegro (70-53) with Anna de Forges top scoring with 18 points. France had an easy victory against Croatia (86-40) with Isabelle Yacoubou-Dehoui, Sandrine Gruda, Edwige Lawson-Wade and Emilie Gomis in double digits. For Latvia's coach from Greece George Dikeoulakos (left) this was not the way he wanted to start EuroBasket 2011 with a defeat against his home country (57-67). However his team made too many errors at crucial times in the game and basically handed the game to Greece with a high number of turnovers. Greece appeared to be running away with the game in the first quarter leading (35-27) with 48 seconds to the break. When Gunta Basko (right) went on a three-point shooting spree to score 3 from the land of many, Latvia had taken the advantage going into the locker room (36-35). The game remained close until the 34th minute with Latvia leading (53-52). But Greece went into overdrive with first Evanthia Maltsi and then Dimitra Kalentzo connecting from the land of many. Latvia were knocked out cold and Greece went on to win (67-57). Spain led from start to finish as they got their EuroBasket Women 2011 competition off to a good start. Although Germany did not make it easy the Spanish players were too strong in the paint and had more offensive options. Alba Torrens led the way with 18 points while Elisa Aguilar contributed 17 points from the bench. Amaya Vademoro also came off the bench to score 16 points. Romy Bär led Germany with 14 points. Spain were quickly into their game and on the very first attack Anna Montañana (in picture) connected behind the arc. She was on hand 20 seconds later to score from a similar position but before the three-point line. Germany struggled to find their range with a couple of air balls and a 24-second clock violation. Then Spain scored again as Silvia Dominguez was allowed to drive into the lane for an easy basket. Germany did finally get on the score sheet with Bär (right) hitting a pair of free throws. However disaster struck Germany as their captain Dorothea Richter went down clutching her thigh. All the same Germany started to score points. But Spain had the upper hand leading (13-8) with 3 ½ minutes to play. Valdemoro and Aguilar came off the bench to stretch the Spanish advantage into double digits (18-10) by concluding fast breaks. 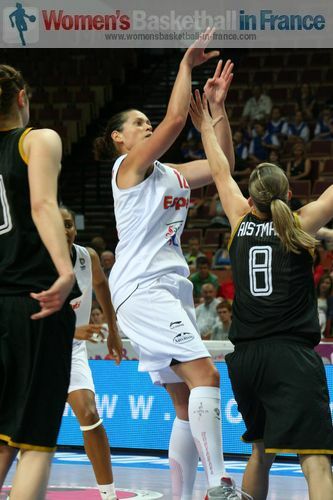 Germany were not having much luck in scoring and Spain raced to a first-quarter lead (21-12). Germany picked themselves up at the start of the second quarter with Richter returning to action. Anne Breitreiner and Svenja Greunke both got on the score sheet as their side reduced their deficit to 3 points (21-24). Sancho Lyttle who had been quiet in the first quarter took over from Cindy Lima in winning all the rebounds at both ends of the court for Spain to go 10 points clear (31-21). Once again Richter (left) had to leave for treatment. However this time Germany did not fall apart despite not having anybody to stop Spain in the paint. Spain went into the locker room leading (39-27). When Spain went to sleep at the start of the third quarter, Bär found her scoring touch with back to back three-pointers for Germany to come right back into the game (42-45) with four minutes remaining in the quarter. Spain woke up with their veterans Aguilar and Valdemoro as the catalysts in a 60-second 7-0 burst. Despite a German time-out Spain went into the final quarter ahead (58-49). Germany continued to work on bringing the score down. With five minutes left to play they trailed (62-66). Yet Spain was too experienced to panic and cruised the rest of the way to victory (79-69). Montenegro have won their first ever game in the final phase of EuroBasket Women by beating the hosts. Anna De Forge led the scoring with 18 points while Iva Perovanovic finished with 17 points and 8 rebounds. It was a miserable night for the hosts who never got going with only Agnieszka Szott in double digits with 11 points. Montenegro were first on the score sheet with just seven seconds played with Perovanovic getting inside the paint for an easy score. The Polish fans had to wait for just over a minute to cheer Justyna Zurowska getting on the scoreboard. The two teams traded basket for basket until the eighth minute with the hosts leading (13-12). Montenegro put the first run together with 6 straight points. They were looking to finish on a flourish but it was Poland through Agnieszka Skobel who finished best in running down the clock. She picked up an offensive rebound and managed to put the ball overhead into the basket all on the buzzer. Poland levelled the score with the first 3 points of the second quarter (18-18). This was the last time the teams were tied. Montenegro, playing better collectively, put two runs together to open a double-digit lead going into the break (37-26) with former LFB players Perovanovic (Montpellier) and Jelena Dubljevic (Tarbes) (above in picture) scoring. The guests went into the second quarter leading (18-15). However a three-ball by Malgorzata Babicka had the teams level once again. Dubljevic and Perovanovic were leading the way with 9 and 8 points each. The home fans were hoping for some fireworks and urgency from their players. Instead they had to watch Montenegro maintain their advantage for the first seven minutes of this quarter (33-43). A couple of mistakes by the guests gifted Poland a couple of free baskets. But a trey by Forge put Montenegro back in charge. Poland started to become careless and gave Montenegro three trips to the charity stripes which resulted in 6 points and a (54-38) advantage. The game fizzled out as a contest early in the final quarter. 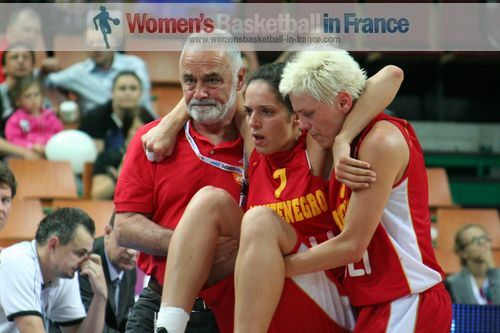 Ana Baletic (in picture) from Montenegro fell during a scramble and had to be carried off the court. Montenegro ran out winners against the hosts Poland (70-53). France showed no mercy to Croatia as they cruised to victory (86-40) to start their defence of the EuroBasket Women title. They made Croatia work hard for any points as Sandrine Gruda and Isabelle Yacoubo-Dehoui (left in picture) combined for 5 blocks. France also pulled down 54 rebounds of which 39 were on the defensive end. All French players got on the score sheet with nobody playing for more than 20 minutes. France were quickly into their stride with 9 points within the first two minutes. Sandrine Gruda hit the first 4 points. Céline Dumerc then fired in a trey while Emilie Gomis completed the riot with a drive to the basket. Although Croatia managed to slow France down a little Clémence Beikes made it (11-0) for France. Croatia finally got off the mark with Mina Mazic splitting a pair of free throws. Croatia was having no luck at all whereas France extended their advantage (14-1) midway through the first quarter. France continued their one-team show and had a maximum lead (21-3) before Croatia scored their first points from open play by Iva Ciglar hitting a trey with just under eight minutes played. Croatia’s only solution for the rest of the quarter was to shoot from far. They had some success as they trailed by just 10 points at the end of the first quarter (16-26). It was one way traffic with France dominating all sectors of the game to go into the locker leading (48-25) with 11 players on the score sheet. The only points from open play for Croatia came from behind the arc with Sandra Mandir and Ciglar connecting. Nothing changed after the interval with France going (71-35) into the final quarter. Yet Yacoubou-Dehoui blocked hard to prevent a score at the end of the third quarter. Nothing of importance happened in the fourth quarter with France winning (86-40).